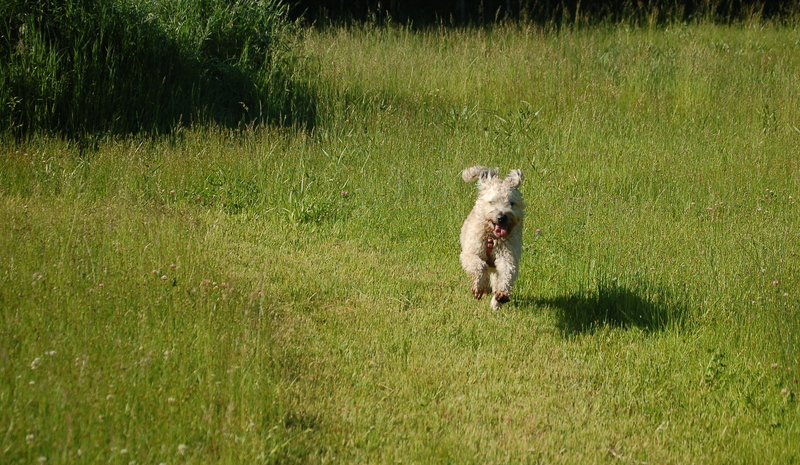 Farley, my wheaten terrier, loves to run. If he can run off leash, he is ecstatic. I only let him do this if he is in a safe place. In the photo, he’s running in a wheat field in Manitoba. When I take him running with me on the road or on paths he is on a leash. For my safety, I have a leash with a belt. I wear it around my waist and that way, if he jerks sideways at, oh say a rabbit, he won’t jar me. This protects my knees and shoulders. But really I’m writing about dog safety. First, learn the dog’s limits. Farley can do 10K. More than that and he seems sore. I’m not sure running in a straight line at a consistent pace is what dogs are build for. He can run forever off leash and not show any signs of soreness. I have a command for him to run on my right side. He’s been trained to heel on my left, but this doesn’t work while running. On the right, he is tucked between me and the side of the road. This allows cyclists to pass without the worry that Farley will dart in front of them, and it allows me to be sure he won’t dart unexpectedly in front of a passing car. If there are other dog walkers coming the other way, I have better control of Farley so he can’t stop of a visit. If you have any tips about running with your dog, I’d love to hear them.